Sunday night football kicked off at a crisp mid-60s in Sports Authority Field at Mile High Stadium. Millions were tuned in to watch the Denver Broncos host the San Francisco 49ers. While the viewership is common for any Sunday night football broadcast, this night was special as Peyton Manning was biding to break Brett Favre’s passing touchdown record of 508. Manning let there be no doubt he would break the record Sunday night as he started off the game seaming touchdown passes to Emmanuel Sanders and then Wes Welker. Each in the open field as if Manning’s offense had completely stifled a normally powerful 49ers defense. Growing up as a Colt’s fan, I’ve had the pleasure to watch Manning evolve into the quarterback is currently is. I remember the excitement that would come every game day watching Manning pump-fake, step up in the pocket and nail Marvin Harrison. Harrison’s lightning ability as a receiver complimented Manning much like Demaryius Thomas and the rest of the Bronco’s receiving core does now. Watching Manning line up out of the shotgun with Demaryius Thomas out wide right, I could almost predict the pass was going to him. When Manning took the snap and turned right you could see Thomas get slight separation and Manning laced it with just enough space for Thomas to drag his feet as he hauled in the reception. While it was exciting to watch, it felt more right than invigorating. Manning’s hard work has been well documented throughout his career and getting to this point seemed inevitable. As a nod to Peyton Manning’s amazing acomplishment last night, the ScoreStream group took a look at some high school passing records.You won’t see Manning’s name in any national high school football record books, which should motivate young athletes everywhere to work hard if their dream is to play! Below are some of the high school football passing records we found most impressive. 219- The record for career touchdown passes thrown set by Maty Mauk from 2008-11. Think about that number for a second: 219! 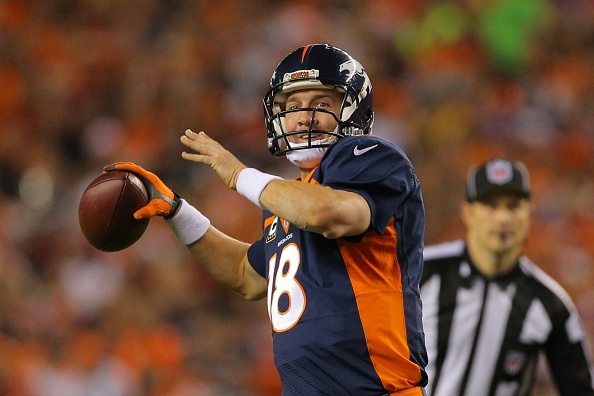 Yes it’s the NFL, but it took over 16 seasons for Peyton to reach the touchdown record of 509. In just 4 seasons oh Ohio high school football Mauk was able to reach almost half of that number! What’s more impressive is that the record for second is 34 touchdown passes behind him! Mauk is currently in college playing for Missouri Tigers. It will take a lot for this record to ever be beaten! 15- The most touchdown passes thrown in a single game set by Arthur Smith in 1921. In a time when football wasn’t about spread offenses and passing, Arthur Smith somehow managed to throw 15 touchdown passes in a game. We aren’t even sure what to say. Instead, we will stand back, give him a standing ovation and shrug! You, sir, have more passing touchdowns than the person closest to you. If this is ever broken, we hope to see the game. 91- The most touchdown passes thrown in a season set by Corey Robinson. Isn’t Kentucky known for basketball?! Corey Robinson didn’t care in the 2007 season as he put up 91 passing touchdowns against opponents! Another record that blows away the next closest which is 77, it will take an impressive season to break. Robinson better have been homecoming king, as he provided the team with 546 points through the air (extra points not included)! 18,932- The most career passing yards set by Maty Mauk from 2008-11. It’s not surprising the see Mauk back here knowing that he also holds the record for passing touchdowns. Fun fact, in his high school career the amount of yards thrown by Maty Mauk translates to nearly 11 miles, or the length of over 63 football fields. That’s a lot of space Mauk covered! A more interesting fact, Maty Mauk dethroned none other than his brother Ben Mauk from the most career yards record. Ben held that record from 2002 until his brother passed him in 2011. Ben is still nearly 2,000 yards in front of second place! The Mauk’s may be considered the Manning’s of high school football! Comment below and let us know your favorite record or who to watch as they go towards breaking a record!